The last time I tried a whole duck breast was at a work dinner, probably 10 years ago. What I received appeared to be a piece of rubber with a layer of fat on top. Needless to say it put me off duck, apart from the crispy kind you get from the chinese takeaway. However I finally decided to give it another go, and followed a recipe off the website of the particular brand of duck breasts that I bought, so I would know I was cooking it properly. 1) Preheat oven 220°C, fan 200°C, Gas Mark 7. Mix 3 tablespoons of the oil with the five-spice and thyme and set aside. Then finely chop the mint and chilli and mix with remaining oil and lemon juice, and set aside. Score each duck breast 6-8 times across the skin and season. 2) Place the duck breasts skin-side down in a pan on a low to medium heat (no oil) and cook for about 6 minutes or until the skin is golden and crisp. Turn the breasts over and quickly seal. After pouring off any excess fat put the duck in a roasting tray skin-side down and place in the preheated oven. 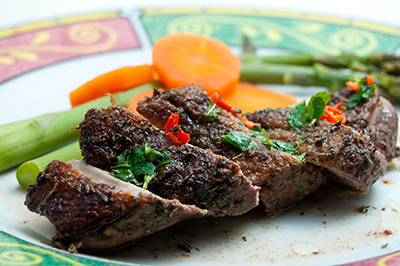 Cook for 10-20 minutes depending on how you like your duck, from rare to well done. 5 minutes before the end of cooking time, turn the breasts over and lacquer with the 5 spice mix. 3) Once cooked, place the duck breast on a chopping board and rest for 5-10 minutes (this is really important and makes the duck even more succulent). Then slice the breasts and pour over the mint, lemon and chilli mix. Serve with crusty bread and salad. Enjoy! I followed this recipe pretty much to the letter. I only had a bottle of lemon juice in so I did use that instead of the fresh lemon juice. I cooked my duck for between 15 and 20 minutes. Having not done it before I didn’t want to end up with it too pink – and also one of my duck breasts was larger than the other so I thought I should err on the side of well done to make sure both of them cooked. Anyway, they turned out perfectly. The duck was really tender and juicy, the fat was crispy and tasty, and the two sauces used complemented each other very well. I wouldn’t have thought of having mint with duck, but it worked. I will definitely be getting duck again, but the downside is that it is quite pricey – its like buying steak – so it will be a once in a while thing rather than a staple.